The rarest sea mammal in the world, the pygmy right whale, was rescued and released from the shores of Namibia. Ruth Leeney, one of the founders of the Namibian Dolphin project, which helped save the whale, told Travel News Namibia the encounter was a once in a lifetime opportunity. Pygmy right whales are so rare that as of 2008 there have only been 25 recorded sightings at sea. These mammals are extremely reclusive, and scientists know little about them. So when a live, young female washed ashore - the scientists at the NDP knew they had to do something. The organization told Travel News Namibia that pygmy was found about 200 meters inland on Walvis Bay, washed ashore by the receding tide. 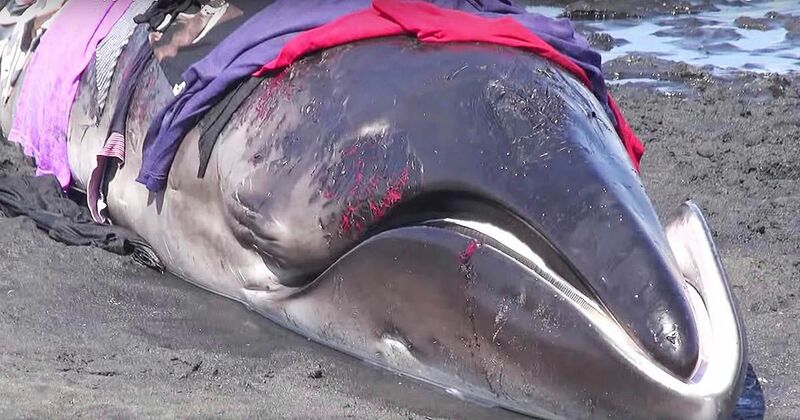 For hours they worked to keep the pygmy right whale cool, and wet - eventually carrying her back out to sea when she regained her strength. But the organization didn't let the opportunity to learn more about this elusive creature pass. Co-founder Simon Elwen explaining they took DNA samples, body measurements, and photographs: “DNA samples contain a vast amount of potential information and the opportunity to collect them from infrequently seen species like this is rare indeed. We don’t currently have a study in place to use the sample, so we will store it for now, but make it available for possibly other scientists/studies." The pygmy's rescuers told Travel News Namibia that she weighed an estimated 300-400 kilograms, and was just over 3 meters long. Whale Facts explaining that a full grown adult pygmy right whale will grow to be over 6 meters - making them the smallest whales in the world. In comparison, a blue whale measures in at over 30 meters. To see this extremely rare creature up close, and watch it's beautiful rescue and release back into the wild - check out the video here below.